Matt Martoccio is founder and co-owner of a local Christmas light installation company, The Christmas Guys. He officially started the company in 2009 and brought a “family style” of decorating the the Christmas light installation industry. With an abnormal passion for Christmas lights and decorating the business continues to expand as The Christmas Guys provide fast, friendly and good ol’ fashion service to their clients. This is the Christmas light installation company you heard on Townsquare Media stations “Seize the Deal,” including WGNA, Santa 105.7, ESPN, Crush and Q103. Visit TheChristmasGuy.com for faqs, past projects and contact information. Matt Martoccio is the operations manager for a popular local interest site The518.org. He can be found writing for the 518.org and also posting on their popular facebook page with nearly 50,000 likes. You know it’s him by his signature “~NY Matt,” well that and his spelling errors. Matt Martoccio is proud to have joined the blogging team for the Troy Record. In his DTOM blog he represents a don’t tread on me American with strong views on life, liberty and everything that threatens these principles. 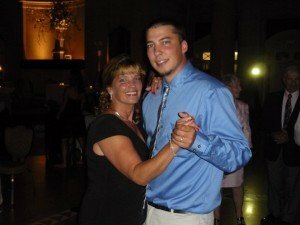 Matthew Martoccio dancing with his mother.